For the town in Alaska, see North Pole, Alaska. The North Pole is the point that is farthest north on Earth. It is the point on which axis of Earth turns. It is in the Arctic Ocean and it is cold there because the sun does not shine there for about half a year and never rises very high. The ocean around the pole is always very cold and it is covered by a thick sheet of ice. There is also a Magnetic North Pole. It is near the physical North Pole. 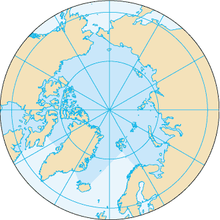 A compass points toward the magnetic North Pole. There is a star called the North Star (or Polaris) that is always in the sky above the North Pole. People can tell how far north they are by seeing how high the North Star appears in the sky. ↑ "CLOSEST DATA FOR NORTH POLE - 440 MI/709 KM, GREENLAND". Weatherbase. Retrieved 23 September 2015. This page was last changed on 20 March 2018, at 18:44.